If you’re undergoing your first root canal treatment, it’s understandable if you’re apprehensive. So, let’s cut to the chase about your biggest fear: a root canal treatment doesn’t cause pain, it relieves it — and saves your tooth too. You need this procedure because decay has spread deep into your tooth’s inner pulp. The infection has already attacked the nerves bundled within the pulp chamber, the source of the pain that led you to us in the first place. The real concern, though, is the infection continuing to travel through the canals of the tooth root. If that happens, you’re in danger of not only losing the tooth, but also losing surrounding bone, adjacent teeth or damaging other important structures close by. Our goal is simple: remove the infected pulp tissue and seal the empty chamber and root canals from further infection with a special filling. We begin by numbing the tooth with local anesthesia — you won’t feel anything but slight pressure as we work. After placing a dental dam — a thin sheet of rubber or vinyl — around the affected tooth to maintain a clean work area, we drill a small hole through the biting surface of a back tooth or in the rear surface of a front tooth. We’ll use this hole to access the pulp, where we’ll first remove all the dead and diseased tissue from the chamber. We’ll then disinfect the chamber and root canals with antiseptic and antibacterial solutions. After some shaping, we’ll fill the chamber and canals, usually with gutta-percha that’s malleable when heated and can be compressed into and against the walls of the root canals to completely seal them. We’ll then seal the access hole. You may have a few days of mild discomfort afterward, which can be managed generally with pain relievers like aspirin or ibuprofen. Later, we’ll permanently restore the tooth using filling to seal the root canal inside the tooth followed by a custom crown that’s fit over and bonded to the tooth. This will further minimize chances of a re-infection. 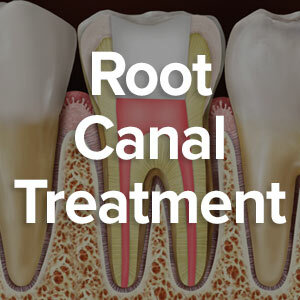 If we’ve recommended a root canal, then we think your tooth should be saved instead of extracted. The procedure will end the pain you’ve been suffering and give your tooth a new lease on life.